Eggs are something that I definitely have a love/hate relationship with. I want to say that I hate them, because honestly I don’t love the flavor of them at all……until I’m craving them like crazy and they sound SO good! Weird, I know. There’s no denying they are a really easy, pretty cheap source of protein so it’s something I have regularly if I’m trying to put a quick meal together with a lot of protein. But for someone who doesn’t love them in the first place, I’ve really got to usually dress up them up with something else or they get old—really fast. Anyone else with me on this one? Are you an egg lover or hater? Well, here are some really fun ways to dress up your scrambled eggs so they are packed full of different flavors and exciting to eat. I feel like scrambled eggs aren’t typically a food people get really psyched over eating. Until now. 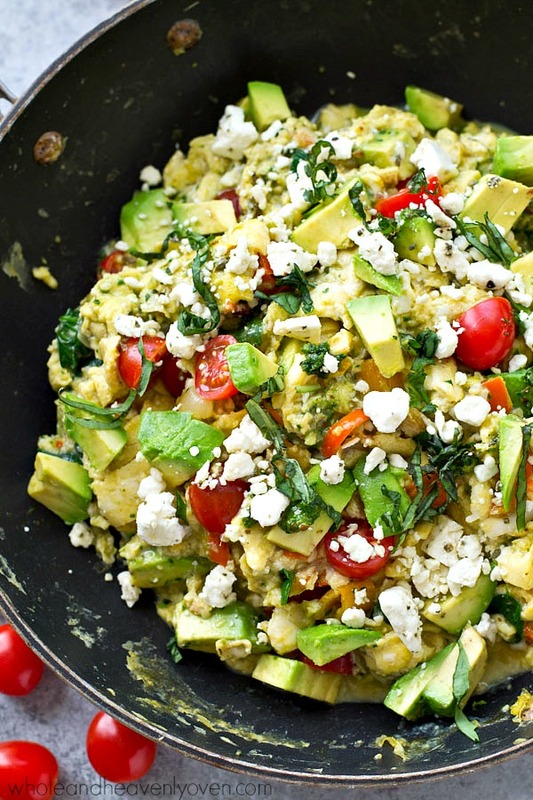 I am so obsessed with pesto so I love this idea of adding them to scrambled eggs! I would have probably never thought of this myself. Just saute up some veggies like peppers, onion and garlic until they are just tender. Add whisked eggs to veggies and gently fold eggs until eggs are cooked, about 5 minutes. Then fold in cherry tomatoes, spinach and pesto. Add crumbled feta, fresh basil and some salt and pepper and you are good to go! Look at those gorgeous scrambled egg toasts! Those look perfectly for a classy brunch or shower. Just broil up some asparagus, toast sourdough slices and spread with butter. 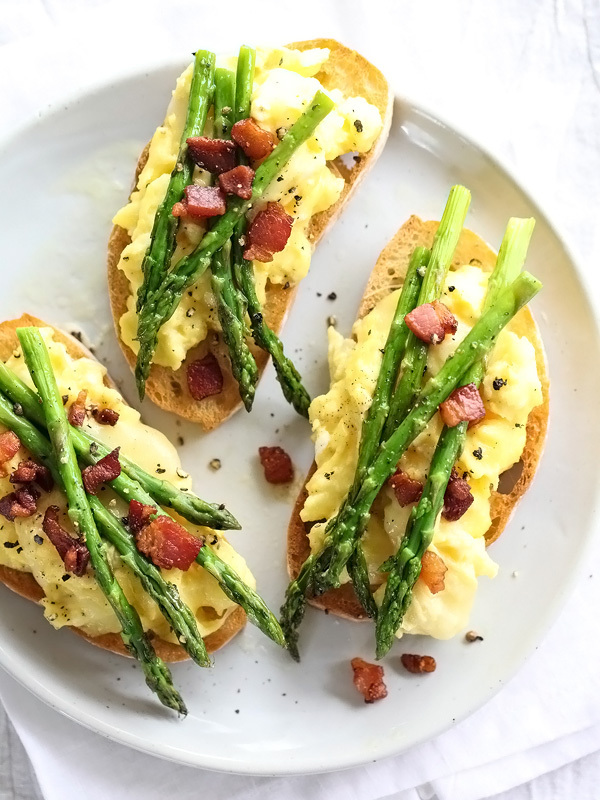 Scramble up your eggs then add them on top of the toast followed by cheese, roasted asparagus and a little bacon or pancetta. Yum! You knew it was coming: some sort of take on Mexican food with scrambled eggs. 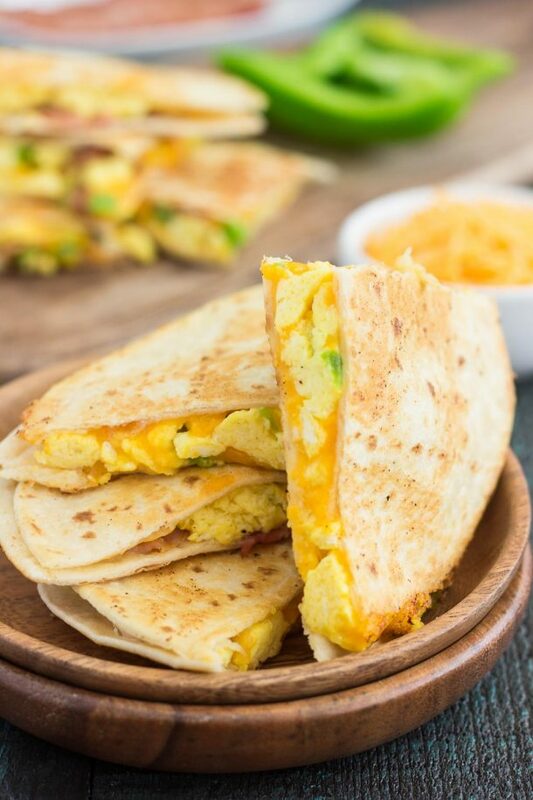 And these super easy breakfast quesadillas with scrambled eggs are sure to hit the spot! Just whip up some scrambled eggs with green onions and add them to your quesadilla. Easy peasy! 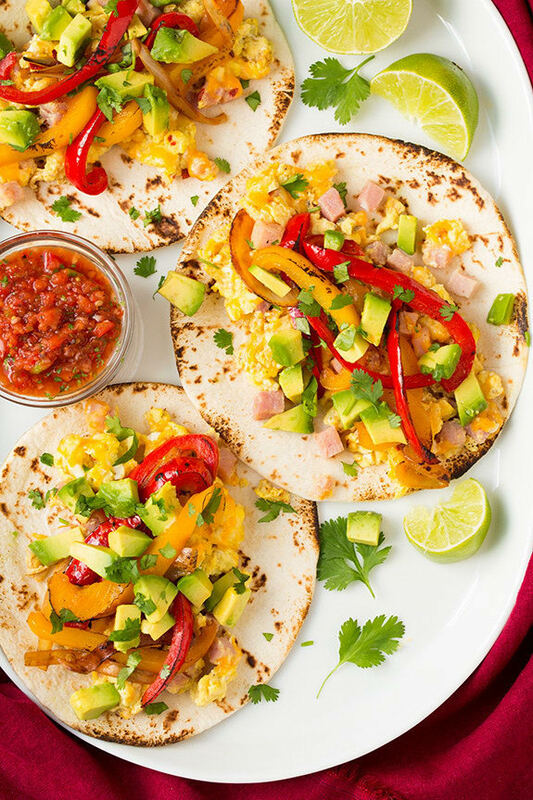 Just an easy assembly of scrambled eggs with cheese and ham, avocado slices, grilled bell peppers and your favorite little flour tortillas. Garnish with fresh salsa, cilantro and limes.